In May 2011, four of the five naked-eye planets gathered along the eastern horizon near dawn. 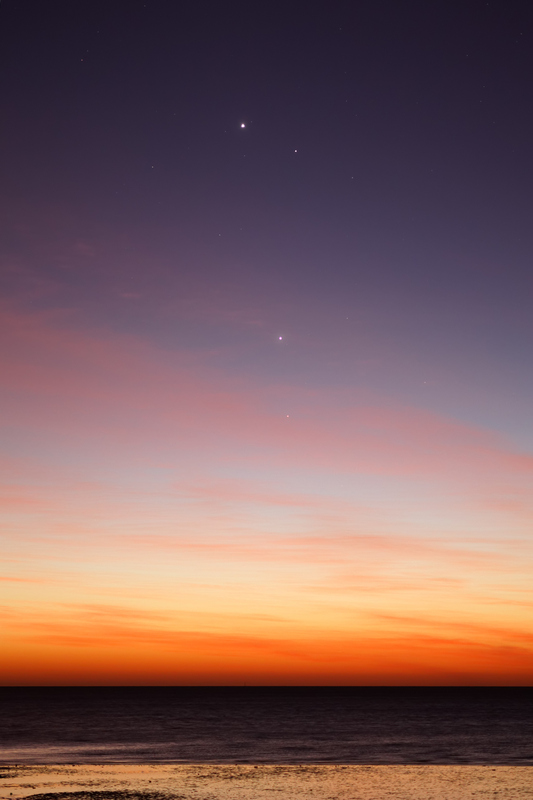 The celestial grouping is seen here just before sunrise on May 5, from a beach near Buenos Aires, Argentina. Starting near the top of the frame, the brightest beacon is Venus. Mercury is below and right of Venus and brilliant Jupiter is lower still, near image center. Below Jupiter, Mars is relatively faint and struggles the most to shine through a thin cloud bank and the warming twilight glow. Watch, and as the month progresses the tantalizing configuration will change, with Mars and Jupiter moving higher while Venus and Mercury wander through the sky closer to the rising sun.